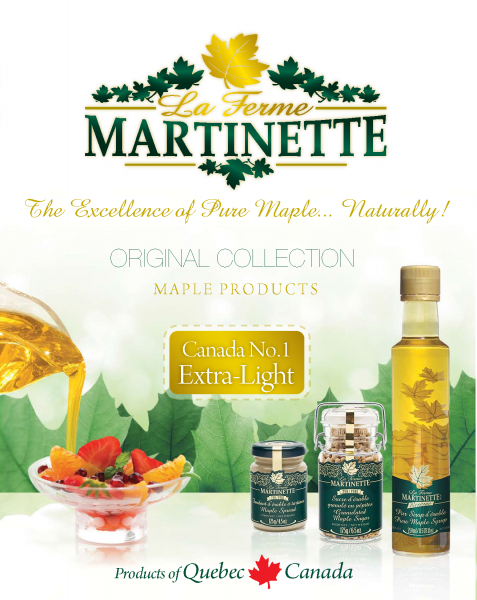 Our ORIGINAL COLLECTION LA FERME MARTINETTE is only made from SELECTED PREMIUM pure maple syrup CANADA NO1 EXTRA LIGHT which gives that rich, delicate , incredible maple flavour. Its very light shiny GOLD color is a sign of very high quality. This COLLECTION represent our most popular and renowned brand because it is the first one we created almost 20 years ago. More than 80 formats are available all year-round. For the Excellence of the pure maple...Naturally!